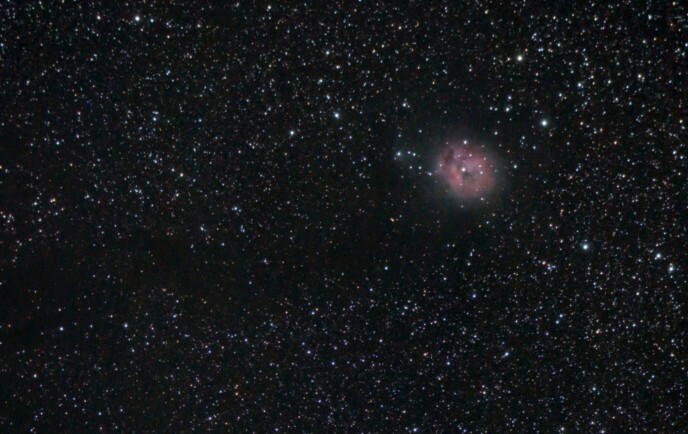 The Cocoon Nebula is located in a crowded field of stars spanning approximately 2 degrees. This interesting nebula resides within the constellation Cygnus, which rises high overhead to star gazers in mid-northern latitudes like myself. IC 5146 is a compact star forming region, with a long trail of obscuring interstellar dust clouds. This nebula is almost 15 light-years wide, and located 4,000 light years away. Framing is important when photographing this object, because you will want to include the long tail of space-dust in your image. The Cocoon is also quite faint, and may not be obvious in your first exposure. Depending onthe amount of light-pollution from your imaging location, you may need to use a light-pollution filter to find it.